Formerly Supergreens 81- New and Improved Formulation! 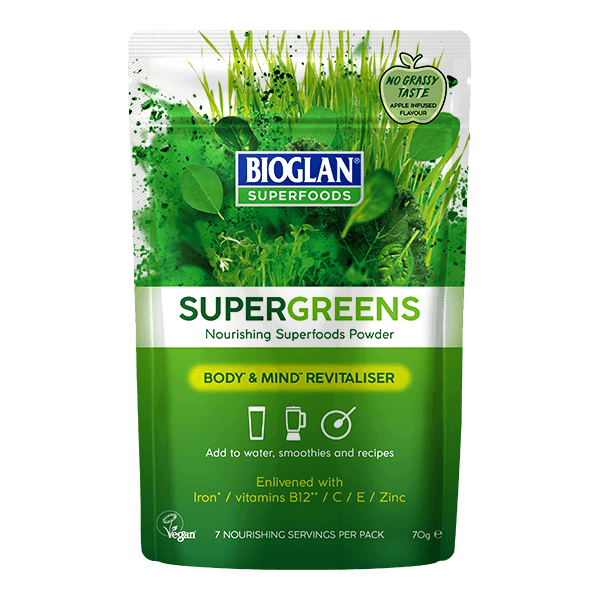 Our unique and nourishing Supergreens blend is bursting with powerful Superfoods, including wheatgrass, spirulina, barley-grass, kale and chlorella. It’s also fortified with vitamins B12, C and E, all packed into a convenient powder so it’s easy for you to use in everyday foods or even just mix with water. 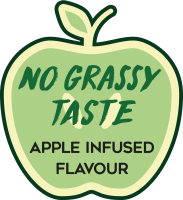 Supergreens’ great flavour comes from apple powder and subtle spices, so now it’s even easier to eat your greens! For an energy boost at the start of the day blend 1-2 teaspoons into your breakfast smoothie. If your blender’s not handy, simply swirl through your porridge or yoghurt. Apple Powder, Mulled Apple Seasoning (Sugar, Apple Powder [Dehydrated Apple, Antioxidant: Sodium Metabisulphite], Coriander, Cassia Cinnamon, Ginger, Salt, Cloves), Powders: (Barley Grass (13%), Spinach (13%), Wheatgrass (12%), Spirulina (9%), Lucuma, Alfalfa, Kelp, Kale (7%), Maca, Broccoli, Chlorella (2%), Moringa, Turmeric, Green Tea Extract), Vitamin C, Ferrous Citrate, Vitamin E (Anti-Caking Agent: Silicon Dioxide), Zinc Citrate Dihydrate, Vitamin B12.